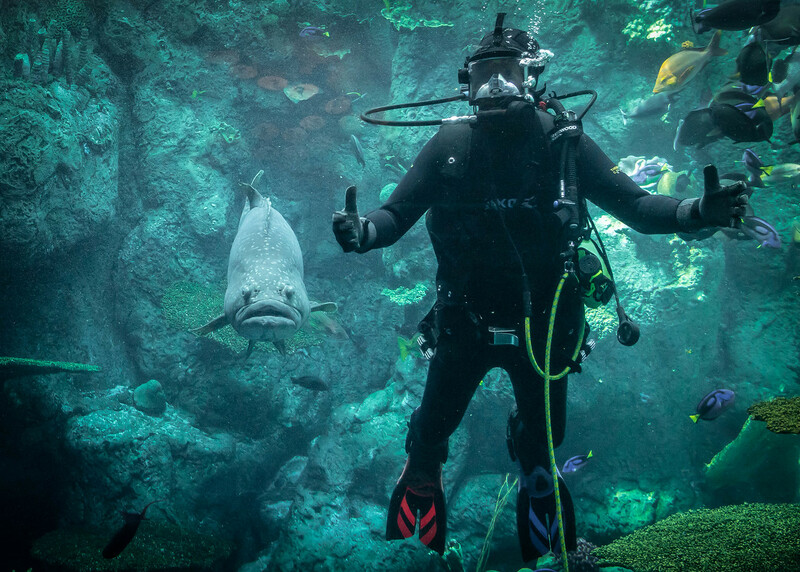 This year, 2018, marks the twentieth anniversary of the Aquarium of the Pacific. Since it seems to be a permanent fixture having survived two decades, I felt it was time I paid a visit. Located right near the Queen Mary, the aquarium is a popular tourist attraction. My family and I went on a weekday in early September. We were hoping the school groups weren’t in full swing yet, and surprisingly, our strategy paid off. There weren’t many people, at least not in the morning. Like any other tourist, I wanted to see everything! We started down the first corridor and wandered at will. Somehow we ended up in the frog exhibit where there are over two dozen very colorful frogs and other amphibians. 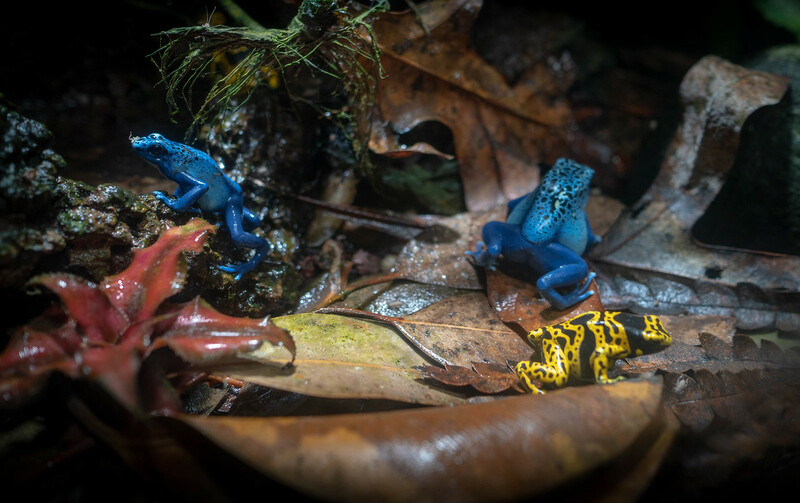 The little blue frogs maybe Blue Poison Dart frogs. The little yellow and black one may be a Panamanian Golden Frog. Don’t quote me; I specialize in dogs. Still, whether poisonous or not, the frogs are pretty. This exhibit wasn’t all about being pretty. The more important message spoke about the disappearance of frog habitat. As with many wild animals, frogs too are having a difficult time finding space next to humans. The aquarium is riddled with curving hallways. I finally made my way back toward the ray touch pool, one of my favorite aquarium activities. Boy, was that water cold! Next, to warm up, we moved to the Lorikeet Forest. How can you miss these birds? Now, you may wonder, as I did, why there are birds in an aquarium. 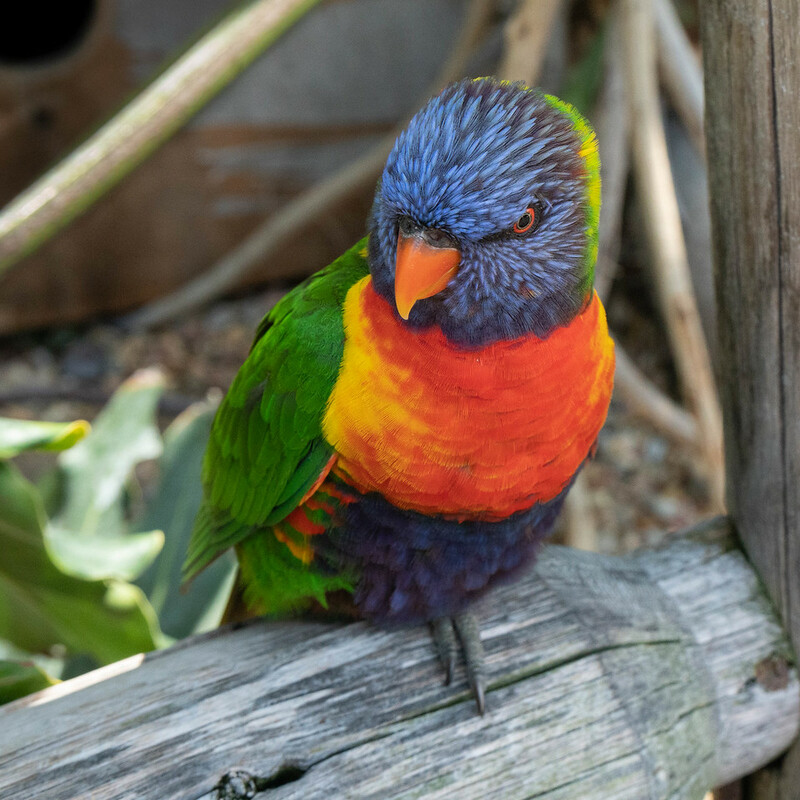 I think it’s because the Lorikeets are from the coastal areas of Australia. That’s as close as I can get to a connection with the ocean. Lorikeet waiting for the next tourist with a cup of nectar. For a few dollars you can buy a tiny cup of nectar. The birds will come and sit on your hand to drink that cup dry! But this is an aquarium and one expects to see fish, so I’ll move on to the main event. Outside are touch pools and demonstrations. Indoors, the walls are alive with sea creatures of all sizes and color. One won’t be bored. I especially enjoyed watching the divers in the tanks. Hi, Mom! These two seem to be posing. The divers went about their business and ignored the big fish, the rays, and the sharks. Of course, they noticed us on the dry side of the glass. Who can resist the jellies? There were several areas where one could see them. They were like marine kaleidoscopes, constantly changing and merging as they formed a new pattern. 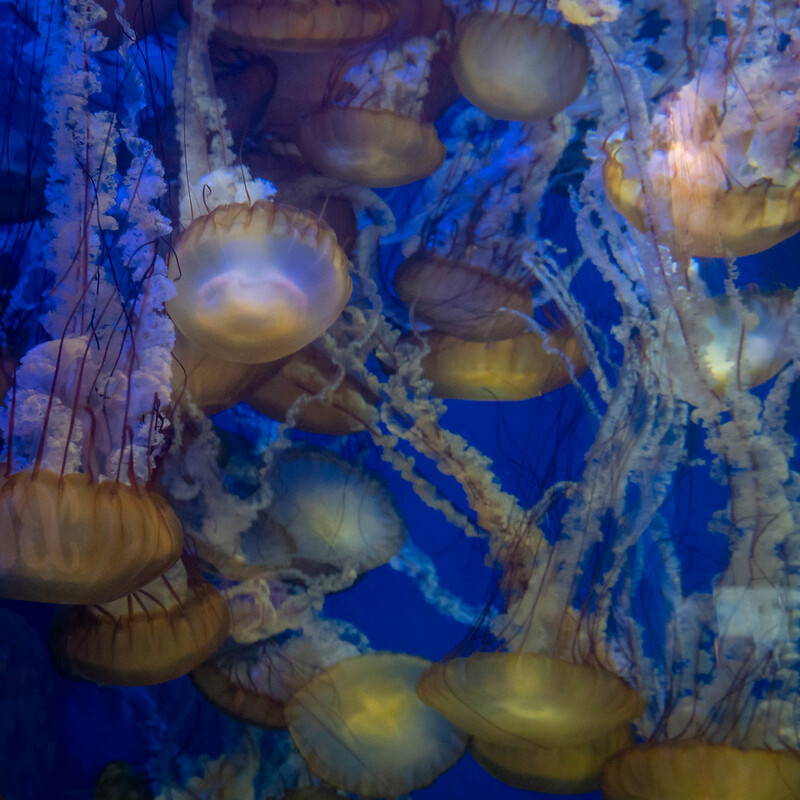 Jellies swirling in and out, constantly swimming. Every now and then I could catch one which broke away from the crowd, but that wasn’t common. Along with the tanks, there was a touch pool outside. I had never touched a jelly fish before. They look so transparent, as though one’s hand would go right through them, Not so. Instead, they feel soft, and perhaps a bit slick or slimy. Let’s just say smooth. 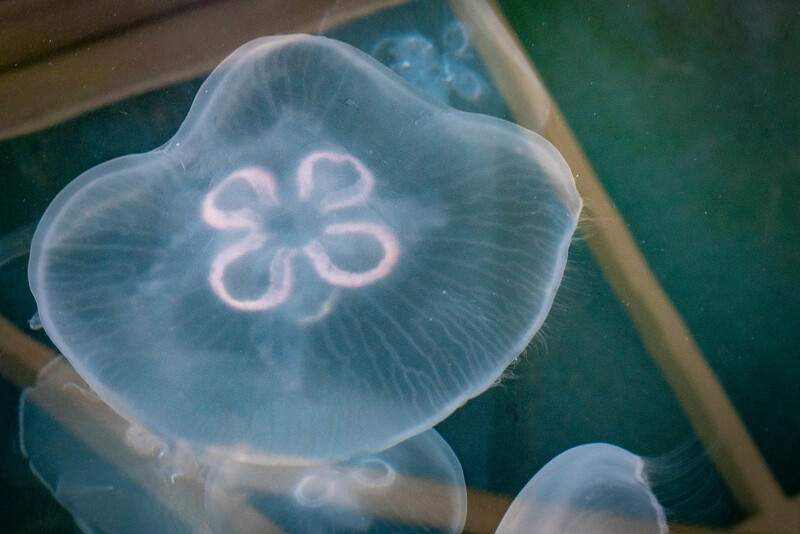 In addition, the flower shape in the middle is the jelly’s equivalent of a stomach. At least, that’s what I heard the docent say. Usually the shape is four petal shapes, but can be five or six. One can never do everything, and all to soon, it was time to face the afternoon freeway traffic. I’ll keep an eye on this destination. On a quiet day, it’s a relaxing place. To see more photos from my visit to the Aquarium of the Pacific, please click here.